I’m doing a rewrite on a manuscript after talking to the editor and have started a new chapter one twice. Each time, although I quite like what I’ve written, I’ve realised it didn’t quite do what it needed to. The question of how to ‘fix’ it stays with me as I do other things, gnawing at me. I try to ‘think’ it right, ‘write’ it right and ‘idea-associate’ it right, but nothing works. Then I let it go. I concentrate on willing the small amount of paint left in the tin to be enough to undercoat the inside of the new/reworked cupboards. And there I am, head deep in the lowest shelf, extending to reach that upper left corner and the answer presents itself, unbidden and just right. This happens so often (the solution provided by the subconscious) that it might be speculated that worry should never be wasted. But although I know how well the subconscious works (better than the conscious??? ), I still try to work through problems consciously. So am I failing to learn from experience, or does the subconscious require a certain amount of ‘gnawing’ first? Not sure. But I am pleased that now I can move forward on the rewrite. Well, the blog tour is over. It was a great way to learn more about Jacqui and ‘Squeezy Cuddle Dangly Legs’, but also about the other bloggers. Though there were some similar questions, most were quite different. Good fun too. I’ve been tagged by Sally from her Scribblings blog. I’m to list 7 random facts about me. I can do that. 1. I don’t like being called Clarence but don’t mind Clarabelle or Claire-bear. 2. I hated my middle name for most of my primary years, but now like it for exactly the same reasons – it’s unusual here in Australia. It’s Malise, pronounced ma-leece. 3. I reckon the coral reefs off eastern Bougainville Island are the among the best in the world…and more accessible. Well, accessible from the beach once you’ve found a way to get to this amazing island north of the Solomon Islands. 4. My parents left home when I was at uni, leaving me and my brothers in the family home. 5. My hardest job was working in a hospital laundry in the height of summer, around hot machines, standing all day. 6. I had a teddy bear until I was 10. It was so worn that my grandmother sewed a suit to the bear to keep his arms from falling off again. I only stopped having my teddy bear when I gave it to our new puppy because he was crying and lonely. He reduced it to ribbons and fluff in one night. 7. My dad once made us a cubby house from an enormous wooden crate that had held a piece of equipment for his work. He cut doors and a window, and Mum made curtains and we’d have tea parties in there. Okay, there’s seven things. But there’s an eighth. 8. I almost never pass on multi-send things. If anyone wants to do this and link back, that’s great. But only if you want to. Touring a new book can be difficult, particularly beyond the area where you live. Try to cover four states in a week, while still maintaining a home presence, that’s almost impossible. But a virtual tour…now that’s not so hard. My interview with Jacqui Grantford is part of such a tour. Six blog stops in six days, this is Day 5. Claire: Today, I’m ‘talking’ to Jacqui, illustrator of the newly released, ‘Squeezy Cuddle Dangly Legs’ written by Peter Whitford and published by New Frontier Books. Welcome to my blog and Day 5 of the Blog Tour. Jacqui, as previously mentioned you’ve illustrated 12 books, 6 of them picture books. Which elements of the process become easier with experience, and which, if any, become more difficult? Jacqui: It becomes easier to let go the more you do….sometimes. With my first book I fussed with tiny little details to an obsessive degree, often with things that weren’t important. These days it’s much easier to evaluate what’s important. You also understand more quickly what will and won’t work to keep the flow and momentum of the story going. Claire: You’ve worked with New Frontier on other picture book projects, as well as with other publishers, where presumably your contact with the author was less. How is this experience different, where the author is also the publisher? Jacqui: It hasn’t been greatly different. Peter very much kept his roles separate. His book was entered into the slush pile without a name, so it had to get past Sophia unbiased. He also didn’t tell me it was his manuscript when he approached me with the project, although I sort of guessed when I started working on it. I was given as much freedom to give my input as an illustrator as on other projects. Although I must admit that the anxiety levels about not mucking it up were higher than normal. Claire: Wishes for One More Day, which you illustrated, was for a US publisher. 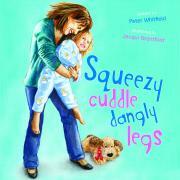 Squeezy Cuddle Dangly Legs and your other books have been published by Australian publishers. Did that have any impact on your illustrating in any way? There are odd little things that you have to change when working for the US. I had to lower the girls skirt on the title page of ‘Wishes’ and there was a huge attention to the tiniest of details in every spread. As far as style, however, it didn’t change anything. They picked me for the book based on some of my examples, so I really had to draw how I normally do. That does of course, leave less room for experimentation. I have since decided that I should be experimental anyway. Claire: You’ve illustrated your own work as well as illustrating the work of others, as in Squeezy Cuddle Dangly Legs. How does the process differ? Jacqui: The advantage to illustrating your own work is that you can change the text slightly if you have a great idea for an illustration and it doesn’t quite fit. Very handy. I think you create a more complete creative package when you’re the sole creator, but you can get too insular and not see the bigger picture. I would be more aware of that next time I illustrate my own ms.
Claire: Are your illustrations the same size as the books they appear in? What do you do with the artwork once the images have been scanned? Jacqui: It depends on the project. The illustrations in my earlier books were much larger than in the book, but in my later books I’ve tended to illustrate size for size, mainly due to time constraints. Also, it gives you a more realistic idea of how the illustrations will look in book format. I’ve discovered that some very detailed illustrations that look amazing large, lose a lot of power when they’re reduced. If I do it size for size then I know exactly what I’m getting. I exhibit and sell the art after it’s been reproduced. Although there are always one or two from each project that I can never bear to part with. Claire: The process of illustrations fascinates me. How do you move from reading a text to visualising what illustration style you’ll use, and what characters will look like? Do you do detailed storyboards? Jacqui: I start with thumbnails that involve stick figures as a guide. I’m about the only person who can actually tell what they’re meant to be showing. After that I move into storyboards that show where the text will be and in this way I’m able to see if the flow of the story works. I also do character sketches and play around with clothes, hair etc. It’s a fun process and always involves input from family and friends. Thanks so much for the interview Claire. Lots of fun. Thank you, Jacqui. It’s been fun to learn more about how it all works. Good luck to you and Peter and ‘Squeezy Cuddle Dangly Legs’. My idea of hell has two parts. One is to be somewhere without a pen and paper. It seldom happens, but I still have nightmares about how I’ll capture that phrase, that idea. The other is to be somewhere, even at home, with no book to read. My bedside table always includes a tower of books. I’m not sure it’s ever been empty. There are old books that I always wanted to read, books I want to reread and then new books. There are also often books that one of my sons has recommended. I used to finish every book I started, even if it was a struggle. Not any more. There are just too many books to read. Although there are exceptions. I did persevere with ‘Life of Pi’ by Yann Martel, although finding the beginning chapters very dense and less than riveting. They were interesting, but I really couldn’t work out where they were heading. I’m glad I did keep going though. The ending stayed with me for a long time. I love the library. I read too much to be able to support my habit without these wonderful places. I do buy books too, particularly Australian children’s books. I’m a big fan of fiction mostly, although I’m growing to enjoy non fiction more and more. Non fiction is seldom bedtime reading for me though. I love that I can call reading work. Whether it’s keeping up with what’s being published, reading to review or for research, reading is a wonderful thing. What a difference a year makes. This time last year, we had 25 12 year-olds here for a ‘not the graduation’ party. They were noisy, messy and full of high spirits. No, that’s not what’s changed. There are 8 of them here tonight for a movie night and they are as loud, messy and high-spirited as they were. But they’ve all hit adolescence. They’re taller, their voices deeper (well, okay that’s just the boys) and their skin is less clear. There’s also this other thing. A confidence that wasn’t universally there last year. Perhaps it’s to do with being at secondary school. Perhaps it’s to do with hormones. I don’t know. But it’s lovely to see. These child-adults who zing effortlessly and endlessly between the two states. No wonder fantasy fiction is so hot with this age group, where main characters are their age and can do almost anything, with none of the constraints that the modern world seeks to impose. One of the questions most frequently asked on a school visit is ‘Where do you get your ideas?’ It is both the easiest and most difficult question to answer. ‘Everywhere’ and ‘All around me’ are my first answers. But what does that mean? What inspires one person may be hardly noticed by another. What inspires on one day, may fail to do so on another. Sometimes ideas pop like the cartoon light bulb – fully formed and brightly shining. Other times a sound, an image, some words spoken will zing an idea into life. Like many writers, I’ll jot down ideas, collect pictures, cut out newspaper articles and store them for inspiration. Photos will do it too. Sometimes what they will inspire is unclear, they just catch your eye and invite a closer look. 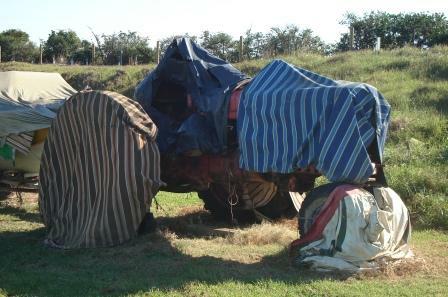 This photo is one of those…a tractor in pajamas. Will it inspire a piece of writing? Who knows? But meanwhile, I just like looking at it.